Spaghetti squash, that weird winter squash that stands out from it’s peers by shredding into strands when cooked, has been piling up at my house. I thought I had pawned it off on my daughter to eat, but I found several of them in our pantry after she departed for Hawaii. (She’s surfing and playing for 8 months until culinary school starts and is working as a cook at Morimoto Waikiki – how cool is that?!) So in my constant battle to add interest and flavor components to vegetables (aka disguise them), I created this easy casserole. 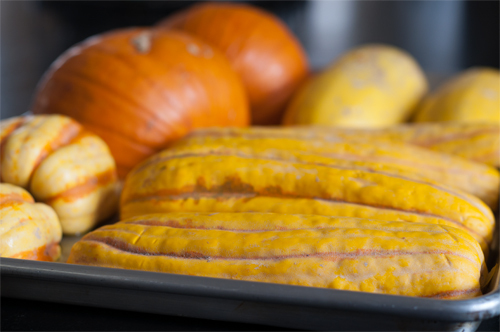 When I have a bunch of winter squash, I usually cook it all at once. I can’t tell that much difference in taste between butternut, pumpkin, or the other varieties of winter squash. So I bake them all, let them cool, then scoop the cooked flesh into a freezer bag to use later in soups or sauces. But the spaghetti squash, with it’s stringy little strands, doesn’t work like this, so I turned it into a casserole instead. Simply combine cooked squash strands with ricotta, egg, sundried tomatoes, Parmigiano Reggiano cheese, and seasonings and bake. 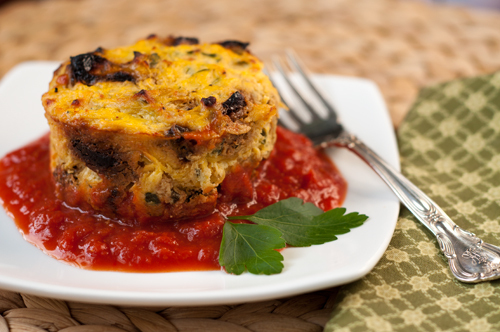 I served it with a simple marinara sauce which was a nice complement to casserole. But you don’t need to – the casserole is moist and flavorful on it’s own actually. And although I made mine in two ramekins because I was only making a quantity for 2, you can double this recipe and bake it in an 8 x 8 baking dish. 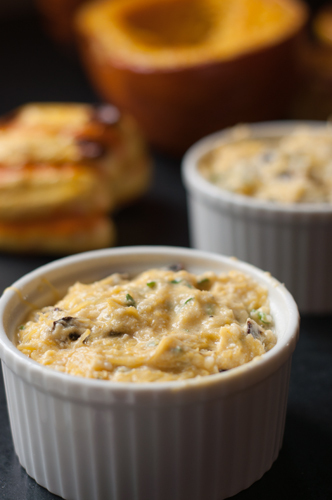 Serve as a side dish or a vegetarian entree. Mix all ingredients together and pour into two ramekins that have been sprayed with cooking spray. Bake at 350 degrees until cooked through and bubbly, about 30-40 minutes. Serve with marinara sauce if desired. I never thought I would see the day that you actually ate the squash. I thought they would just go bad haha. This sounds delicious though, even though I have a feeling you couldn’t even tell it was squash. 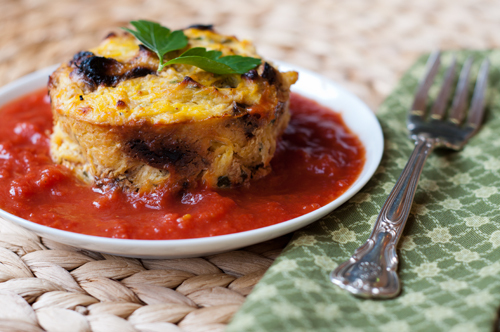 What a great way to use up spaghetti squash. I love that you paired it with tomato sauce which is one of my favorite accompaniments. Spaghetti squash doesn’t have much flavor on its own but treated as you did, it can really be a delicious dish. Love the crust you got on the top. Yes, I’d say the farthest thing from her mind is that spaghetti squash! 🙂 This is very creative Michele. Great presentation and sounds delicious. I love spaghetti squash. Can’t wait to try this recipe!